By Angela Doland . Published on February 12, 2019. 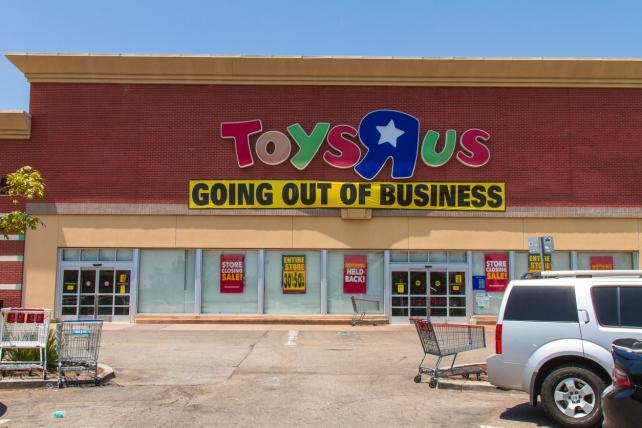 Even if nothing much comes of this, here's one consolation for nostalgic fans: The Toys R Us brand lives on in many other global markets. CNBC says it has 900 global stores that brought in more than $3 billion in overall retail sales last year. Gucci and Prada just got into trouble for designs that evoked blackface, and now pop star Katy Perry's fashion line is getting flak too. Her brand made unusual shoes that have a face on them, with blue eyes and red lips stuck onto the uppers in Mr. Potato Head fashion. There's a black version and a tan version. Some commenters see blackface in the black design, and a few reports (from TMZ and NBC.com) say the brand is pulling the shoes. "While it's entirely plausible that the shoes were not intended to offend or evoke racist imagery (they might very well have been inspired by Charlotte Olympia's popular 'kitty flats' or Picasso's Cubist portraits) the misstep highlights an ignorance of cultural context and perhaps a lack of diversity among decision-makers." For what it's worth, some people didn't see blackface in this design. One Twitter commenter weighed in: "A face on a black background doesn't automatically make something blackface. These are just flat out ugly shoes, but they're not racist." Just when you've finally figured out what "Fortnite"'s all about, now there's a new video game you'll be hearing about. "Apex Legends," a free online multiplayer battle royale game, launched a week ago, and is already claiming 25 million users. The game is notable for its unusual marketing strategy: It didn't have one. It launched suddenly, with no promotional campaign beforehand, Ad Age's George Slefo reports. Publisher EA "announced and released the game on the same day, a far cry from its typical tried-and-true strategy of marketing heavily through both paid media and press interviews roughly one year before any given release," Slefo writes. People say it's a high-quality game, which helps build interest. Plus, it's free. New job: Edelman is hiring creative Judy John, known as a driving force behind Always' much-awarded "#LikeAGirl" campaign, as its first global chief creative officer. Read more by Ad Age's Megan Graham. Flat: CBS's broadcast of the Grammys averaged 19.9 million viewers, according to Nielsen fast national data. And that's a smidgen more -- 0.5 percent more -- than last year. Read about it from Ad Age's Anthony Crupi. 'America Is Watching': Fox News has a new pitch for advertisers, under the marketing slogan "America Is Watching," Variety reports. Fox also made a map to show that "no matter whether the region tilts red or blue politically, Fox News is the most-watched cable-news outlet there – pressing against the notion that the network is only for conservatives," the report says. Things that make you go hmmm: The National Enquirer's parent company "inquired about having to register as a foreign agent after publishing a glossy magazine promoting Saudi Arabia and its new crown prince," The Wall Street Journal reports. PSA: "The Centers for Disease Control and Prevention is blaming nicotine vaping devices like Juul for single-handedly driving a spike in tobacco use among teens, threatening to erase years of progress curbing youth use," CNBC reports. Ad No. 2: Errol Morris, the documentarian who made Oscar-winning "The Fog of War," has made some Chipotle ads. One features a restaurant worker smashing avocados into a giant bowl of guacamole, a scene that's oddly satisfying. Read more by Ad Age's Jessica Wohl, and watch the ads here.